U Vystřeleného Oka is a historic bar located in Prague, Czech Republic. This picture was sent in by PD. He writes: "Named for [the] one-eyed hero Jan Žižka, whose statue dominates the skyline of Žižkov, the walls of this place ooze a childish sense of humour, covered as they are in nonsense and art by illustrator Martin Velísek. 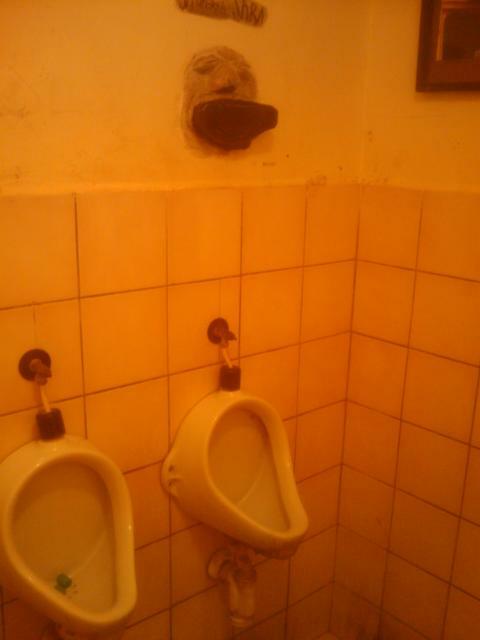 They look after you (if you're in the gents), by providing large padded headrests above the urinals. A really traditional bar usually filled with locals."